It’s another season of love – the Valentine’s Day week. Yes, it is here again, precisely on Thursday, February 14. It is the continuation of a season when love and lovely people are celebrated. And at times like this, one asks, is the flavour of love made for a particular group of individuals? No! Those who think that the Valentine period is meant for couples and would-be-couples are not right in their submissions because love encompasses all. Even God in heaven is a God of love. Well, for the calendar specification and what we all celebrate, it is mandatory that each and every one of us has the responsibility of showing love to one another in our various little ways. We are also supposed as humans to show love, care, and support to one another whether in good or bad times. Most importantly, we should carefully observe ourselves and ask if we truly love our neighbours like ourselves. When we discuss the various challenges of life, in positive and negative spheres, our neighbours are involved in one way or the other. No one had rejoiced or bore one’s challenges alone. As long as there is life, people ought to remember that in laughter and tears, in sickness and health, we need one another and that is the reason we should celebrate ourselves whenever the need arises. Some neighbours have grown and developed strong feelings for one another like blood siblings while some others are sworn enemies even after long years of sojourn, yet we claim we love our neighbours like ourselves. So, individuals who do not understand that their neighbours are God’s special gift to mankind should begin to re-adjust and be born again in their thinking. Those who look down on their neighbours because they do not belong to the same social status should also begin to have a serious rethink of themselves. Those who are in the ‘public service’ and look the other way when their neighbours are mentioned are not getting it right at all. Yes, so many may have paid their dues in trying to make ends meet in life. But people differ, so, whatever that is positive within us should be added to make life worth living for the others. The principle of love is not about physical cash alone, but should cut across all spheres of life such as giving advice, correction, teaching, mentoring, reprimanding, giving, and using positive instances to teach others, among others. Neighbours referred to here could be members of the family, trainees, apprentices, colleagues, classmates, fellow traders, all acquaintances, including those who live in the same vicinity with you. Where someone spends at least eight hours daily, people met in such places for such a long time should not be joked with because they now form part of your neighbours. When the seed of love is spread to all nooks and crannies of different families, communities, and the larger society, definitely there would be greater turn around in relationships, contributions and better quality of lives. Tears fell off my eyes when a certain Intensive Care Unit of a Children’s Hospital was closed down because the professor in charge resigned in anger. There was no standard trained officer to take over from him because he never mentored his neighbours who were his students until the Teaching Hospital searched and got a replacement from somewhere else. A very rich woman was scorned and robbed at death instead of her neighbours mourning her. Her children held prestigious positions in various blue-chip companies and she was financially comfortable. People usually go to her when she was alive for financial assistance, with some giving their landed property as collateral. Her home was a mini-foreign supermarket filled with various edibles both local and continental in the village where people were managing to survive. But incidentally, Mama who lived in abundance was not generous at all, she did not show her neighbours love. Even her domestic workers complained of her selfishness, high-handedness and stinginess. People looked up to her in giving because she was an aged Christian mother, with all her children grown up and married, all doing very well, yet giving was not in her dictionary. She took ill and was flown to Lagos by her children for better treatment. After some days, news of her death flew into town. Instead of mourning the demise of the woman, robbers broke into her home and made away with all she stocked in her house – sealed up food stuffs in cartons, household things, boxes of wrappers and her expensive jewelleries – apparently laughing at her death. Thereafter, her burial was come, eat and drink and go home. This made people wished she should have witnessed how her tightly held possessions were carted away. Also a retired teacher whose children reside in the North would send a pick-up van filled with tubers of yam for her and others, but she would not share the tubers with any of her neighbours so designated until the yams are half-rotten before she starts to give them out. Truly, these set of women are not love personified. A financially strong female banker who has all her secondary and university school-suitcases carefully stacked on her wardrobe, all filled with clothes, peeled shoes and bags see nothing wrong in keeping them for over 20 years. Even as a banker whose priority is ‘super dressing’, she has acquired new ones, yet, she cannot decongest her wardrobe to the needy. It is still happening today. What you do not need, but cannot let go means you do not love your neighbour like yourself. All concerned citizens who make public declarations during church launching and walk past a neighbour who struggles to complete her house rent or children’s school fees should repent. Yes, you want the public to sing your praises, but look inwards and wipe out some tears. What will you tell a class of medical students in a particular university who has been contributing towards the welfare of their classmate who sustained injury in the swimming pool? They were young medical students who went for a social gathering and this boy was unlucky to have sustained a head injury and was hospitalised for years. His other classmates had graduated and started working in various hospitals while some relocating abroad for greener pasture, but have links through a social media platform. When the victim recovered a bit, he confided in one of them that his only certificate was a secondary school certificate since he has not graduated from the medical school. The doctor alerted others, including the ones abroad who secured admission and visa for him. All contributed and sent him to study in a more comfortable zone; not minding the ones they had spent on medication over the years. These students are a typical example of loving our neighbours like ourselves. One of the leading drycleaners in Lagos once told me that his initial capital for his business was given to him by his neighbour who was not even of the same tribe with him; they were just good neighbours in the same compound, but the investor saw the passion in him and was convinced he would do well in his chosen career. He was not afraid when he invested in his business and the receiver did not disappoint. When people sow bad seeds of neighbour negligence, they forget that in times of crises the neighbours would be the first to assist before siblings would come from far and near. A careless woman locked up her children at home and went for a church night vigil. The surge of the light in the wee hours of the night erupted fire in the neighbourhood and her kind neighbours who she belittles broke her door and saved her children. Her so-called enemies surprised her and she repented by force. We can go on and on in citing cases of being good neighbours; so the season is here again to show love to one another no matter how little. People who are alive should celebrate the season by surprising others. 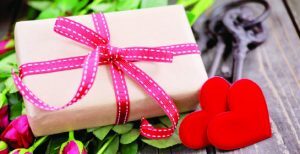 Imagine the amazement and shock when an unexpected friend, church member, sister, colleague or widow wakes you up with a wrapped gift on the Valentine’s Day. Consider the joy and hope it brings. One of the female actresses instead of going to socialize with school children on the Island went to a primary school in Ajegunle to spend her Valentine with the downtrodden school children. When the children set their eyes on their television screen goddess, in their rough and dirty clothes, they were excited as they rushed to touch and embrace her. The excitement and news of the actress coming to celebrate the Valentine’s Day in their school was the story for days. Though she did not give them any money, they were fulfilled seeing her in person. Therefore, in this season, a tablet of soap could put smile on the face of another one, whatever it is, love someone as you love yourself this season. Happy Valentine’s Day.